The heat of Sukhothai was sticky and oppressive, even though it was finally dark. Despite that, we were excited about the prospect of visiting a new town, and hungry for some delicious Thai street food. As we exited the hotel, we saw lights dancing across the river and could hear the bass booming. Something was going on! We wandered across the bridge and found ourselves in a lively night market, boasting all sorts of yummy Thai delicacies- most of which we didn’t even know what they were. We browsed the choices, noticing coconut drinks, fried squids, unidentified balls of something squishy (and delicious, it turns out), Sukhothai style noodles, and frying Roti. After stuffing ourselves, we found our way out of the market into the adjoining park where people we relaxing, working out, and watching a dance performance. 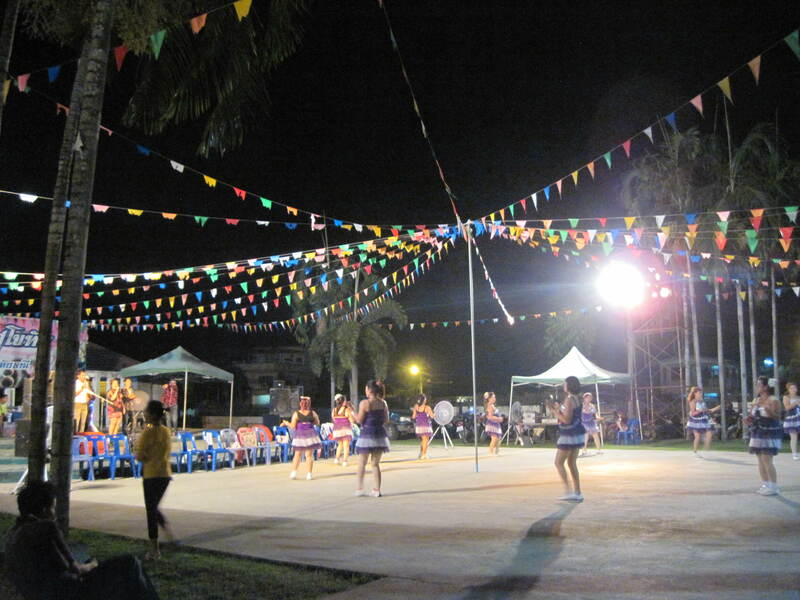 About 20 women, wearing what looked like cheerleader uniforms, were dancing together in the middle of the park in front of the stage of musicians. The dances looked memorized and rote, as if they were well known line dances and occasionally other women from the audience would join. The music was loud, the lights were flashing, and people were watching. We settled ourselves down on nearby steps to take in the sight. It wasn’t long before a local man – gregarious, bearded, and possibly drunk – ran up to to us, bringing plastic chairs. They somehow had appeared and he wanted us to have them. He found more and more till each of us had a seat. Then, he waggled his eyebrows, wiggled his hips, and threw out a hand to Della. Somehow, he must have known that it is impossible for her to say no to a dance. He led her to the stage, where they joined in with the rest of the women who were now doing some sort of circle line dance. The man wriggled and shook, and sort of followed the group. Della tried to pick up the steps and after a few shared smiles with the other women felt like part of the group. A few laughs were shared through a few more dances until the friendly man brought her back to the family. With a quick smile and bow to Eric and Wayne, he disappeared back into the park to join his friends. 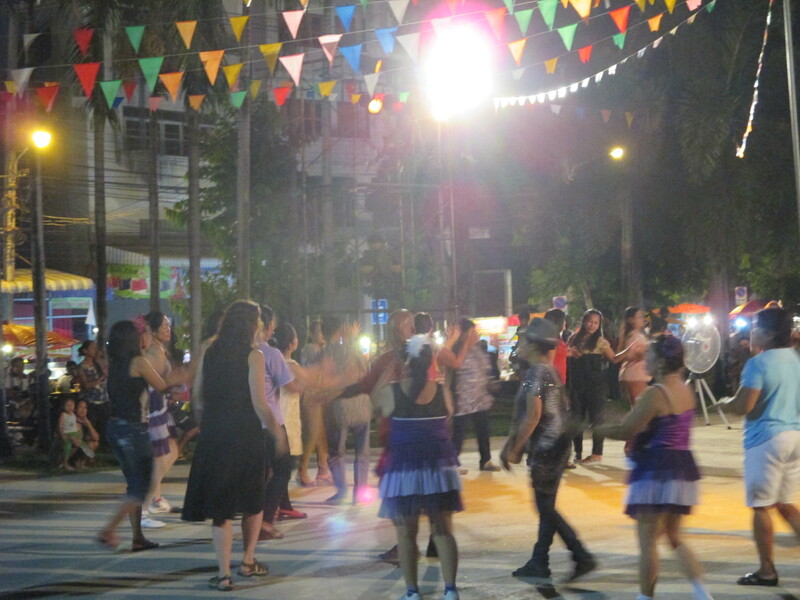 As in Phnom Penh, the ladies of Bangkok (and some men) enjoy a good dance aerobics class. We had enjoyed Lumbini Park on our first trip through the city, and were pleased to learn that there should be dancing in the evening there. After a bit of a lazy, more at home kind of day, which consisted of sleeping in, heading to the mall for lunch, and watching a new release movie, we took a train to the park. There was slight wind, which was a great relief as it wafted by us, slightly cooling our sticky bodies. We wandered through the throngs of joggers, walkers, and general exercisers until we found an area with big speakers set up. We stopped to wait, assuming we had found the place, though there seemed to be no gathering people. 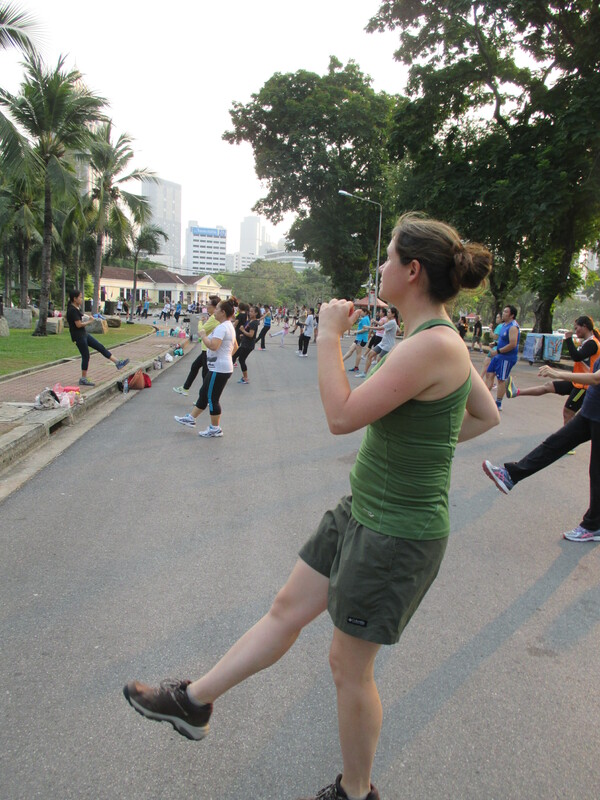 We entertained ourselves by watching a group of young Thai men practicing their acrobatic skills – running and flipping off of the rocks on the grass. As it got a little later, people began to converge on the spot, and suddenly, the music boomed out and it was time to start. The group became huge, close to a hundred dancers, with up to 3 or 4 leaders, spread out so all could see. We danced hard, working up quite a sweat. The routines were simple and easy to follow and we felt in our element. But, all too soon, after only about 25 min, there was a quick stretch and the music stopped. What? So soon? We drank down a bunch of water, trying to rehydrate after we had sweat all of water out, and began to pack up to head home. But then, the loudspeakers played the song we had come to recognize. The music must have said: prepare yourselves, it is almost 6 pm, it is time for the national anthem and respect to the king to be paid. 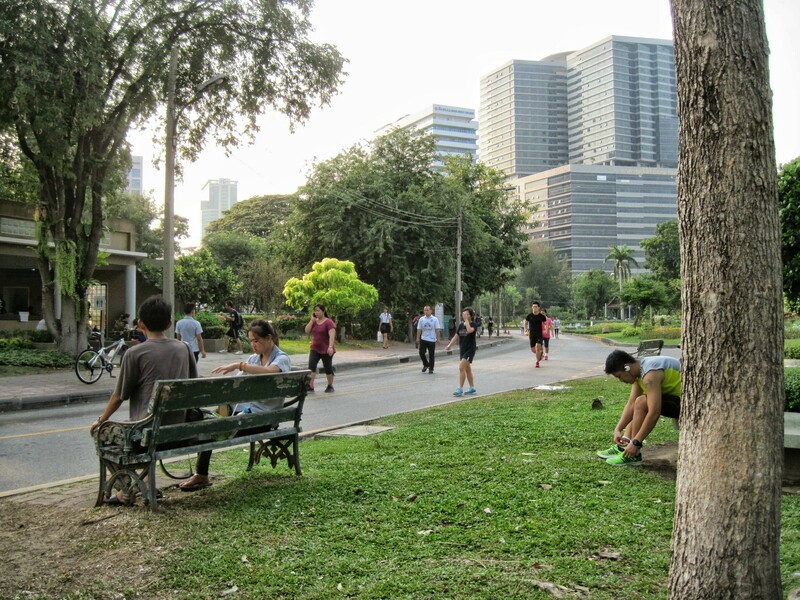 Movement continued, people continued to talk, joggers kept jogging until 6 o’clock on the dot. The anthem started to play and the entire moving park came to a stop. The streams of runners, the walkers, dancers, and even the acrobatic kids were still for the anthem – about a minute. And then it was done, the pause button unpressed, and life moved on. Our dance class started back up. Part 2 was much harder, much more complicated! They must do the same class every evening, but there were those around us who knew exactly what to do, with almost no instruction. It became more and more tricky with long sequences back and forth and even turning around in circles. We flailed around, not really able to keep up with the group, but enjoying our clumsy attempts. Another 30 min passed, we admit this one went a bit slower. We were relieved, sopping wet, when the stretching finally came. 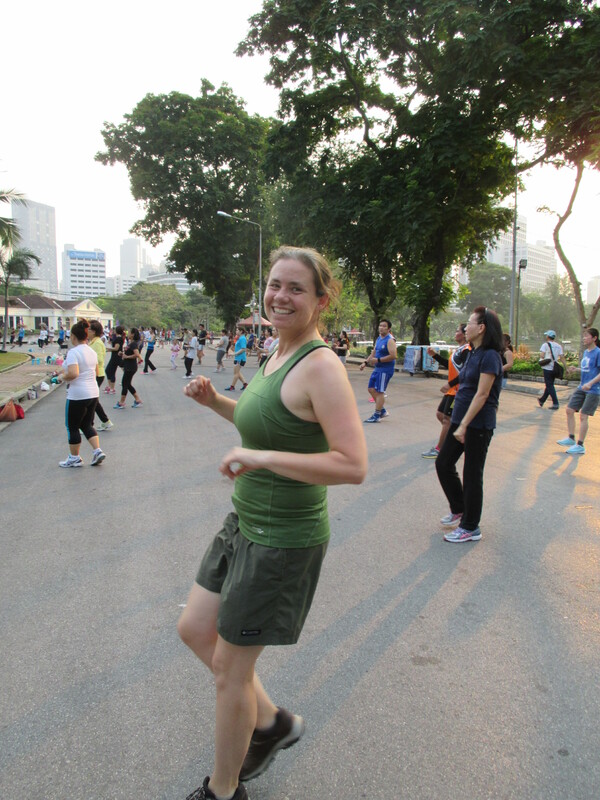 Once again, we really enjoyed participating in a non-tourist activity, and seeing a community come together to exercise in the evening. All these cities in Asia really have it right! I’m sorry, I don’t have any information for you! Good luck!